Senator Elizabeth Warren answered questions from the media after the New Hampshire Democratic Party&apos;s 60th annual McIntyre-Shaheen 100 Club Dinner in Manchester. MANCHESTER, N.H. — US Senator Elizabeth Warren of Massachusetts suggested Friday that Native Americans, not just African Americans, should be “part of the conversation” when it comes to the federal government providing reparations as a way to address ways minorities have been punished in American history. Reparations, either through making simple financial payments or more broadly by addressing structural discrimination via health, education, and housing policies, have been a topic on the presidential campaign trail this week. Four candidates, including Warren, said they backed reparations of some kind to African Americans as a way of addressing slavery and the legacy of slavery centuries later. 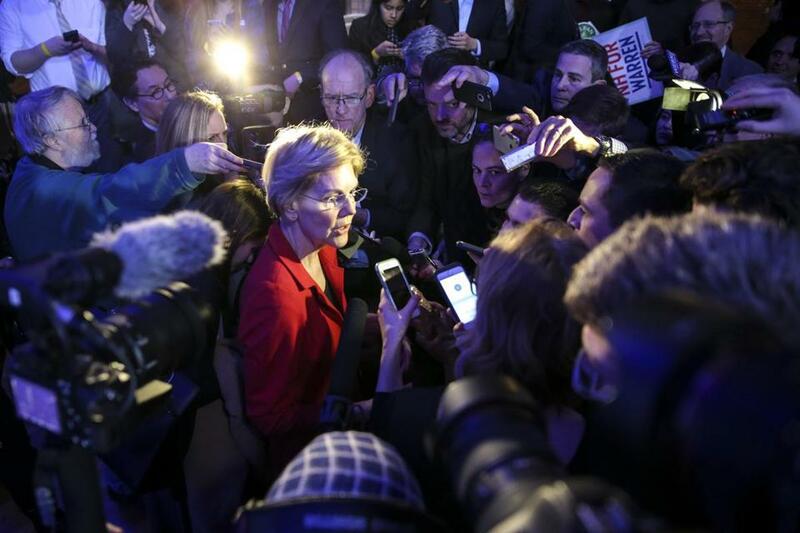 After speaking at the New Hampshire Democratic Party’s major fundraising gala in Manchester, Warren was asked by reporters to expand on her position on reparations. In a follow-up question, she was asked whether Native Americans should be included in the discussion of reparations. “I think it is a part of the conversation, and I think it is an important part of the conversation,” said Warren. Later, the senator expanded on her remarks in a written statement. For Warren the mere mention of the words “Native American” can be tricky political territory. She has faced questions about her own Native American ancestry since her first run for the Senate against Republican Scott Brown in 2012. At the time, she was accused of claiming Native American heritage as a way to advance her career, something she has steadfastly denied. An exhaustive investigation by the Globe last year found that her claim to Native American ancestry was not considered by the Harvard Law School faculty when she was hired — nor by officials at the law schools where she previously worked. While running for reelection late last year, Warren took a DNA test that provided “strong evidence” that she had a Native American in her family, dating back 6 to 10 generations. The test was an attempt to diffuse questions about her heritage but drew significant political backlash. The drip-drip-drip of coverage continued earlier this month when the Washington Post reported that Warren, in her own handwriting, said she was a Native American on a Texas state bar registration form in 1986. CORRECTION: A previous version of this story misidentified the Texas form Warren filled out in 1986.